Defending champs Grove Hi-Tech and Mahaica Determinators secured semi-final berths in the 2nd Annual Stag Beer Super XVI Knockout Championships, edging Pouderoyen Mahaica Determinators respectively on Friday. Played at the Farm Community ground on the East Bank of Demerara, Grove Hi-Tech downed West Demerara giant Pouderoyen by a 2-0 margin to earn their place in the final four. Lloyd Matthews opened the scoring in the 10th minute with a well-taken free kick. 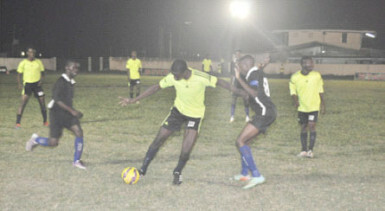 Clive Matthews of Grove Hi-Tech (centre) trying to maintain possession of the ball while being challenged by a Pouderoyen player during their team’s matchup at the Farm ground in the Stag Beer Super XVI Knockout Championships. Awarded the spot-kick at the top of the 18-yard area, Matthews curled his right-footed effort past the badly positioned Sherwin Bernard into the left hand corner of the net. The result was then sealed in a fortuitous manner in the 30th minute when Akeem James’ strike was inadvertently turned into the back of the net by Cleveland Walcott after trying to clear the danger. With the win, Grove Hi-Tech will now lock horns with the winner of the Victoria Kings and Uitvlugt matchup on Tuesday. Meanwhile, the East Coast of Demerara unit upset the highly favoured Den Amstel FC by s 1-0 score line. Guilty of wasting many opportunities throughout the contest, the West Demerara unit lived to rue their profligacy in the final third as Eon Abel netted in the 89th minute. It was a moment of brilliance that sealed the hard-fought contest for Mahaica Determinators in the dying moments as Abel curled his right-footed strike from the top of the penalty area, past the outstretched hand of the keeper and into the left hand corner of the net. Mahaica Determinators will now play the winner of the Ann’s Grove and Beavers matchup also on Tuesday.